Project 1 (Home Theatre) - UPDATED: Done! Finally, we have some real news! Let's start with the exciting conclusion of the original PROJECT #1 from AAAD - the Home Theater Remodel. After several false-starts and delays, we're well underway, and we'll be completely done by Friday. Completely functional! But cables everywhere. We had some built-in open-shelf cabinets around a fireplace, and room for a flat-screen TV. But really, no room for any components. As such, we put a media cabinet to the left of the fireplace. But there was no way to get HDMI cables to our TV... so we just draped them across the mantel. NOT a good look. 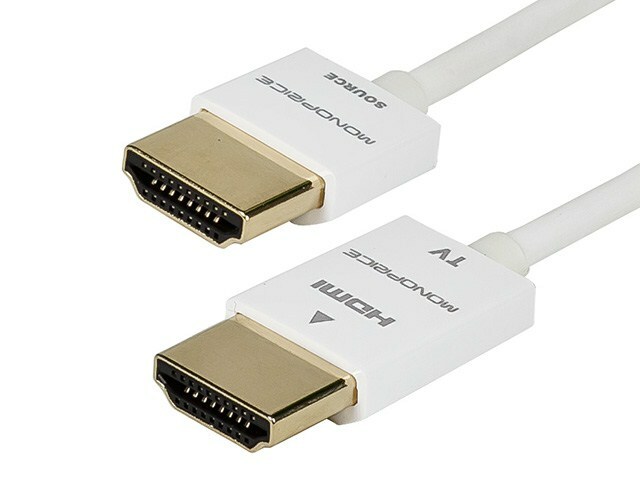 First off, we got rid of our giant black HDMI cables, and replaced them with white Redmere High-Speed HDMI cables from Monoprice.com. But cables still look bad draped across your mantel - even the tiniest cables money could buy. 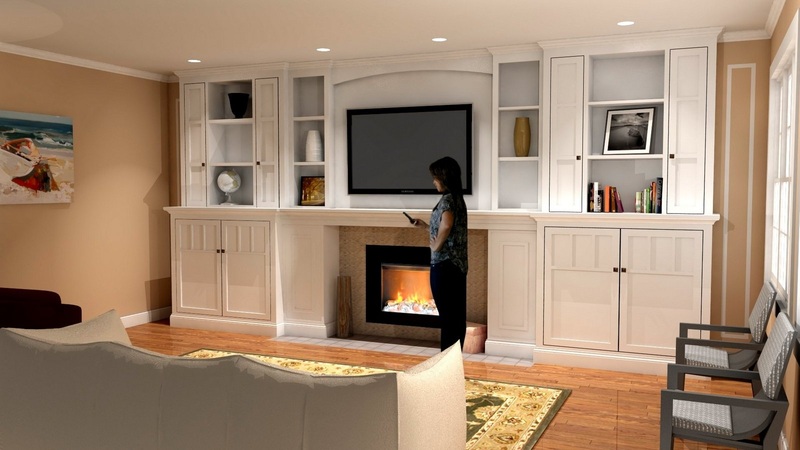 Ideally, I figured, we could add cabinets to the left and right of the fireplace, and hide everything away. There was certainly room to expand the wall unit. But we had some issues -- we have a window on the wall adjacent to the right of the fireplace that almost reaches the corner - so our wall unit cannot be wall-to-wall. And the mantelpiece extended pretty far beyond the existing shelving - which, I figured, was going to require a "gap" piece between the new and existing hutches. It's a good-looking 3D model, but as a design, it's lacking. As Ms. AAAD noted, there are SO many open shelves. What would we put in them? How would we keep it looking remotely nice? So, we enlisted the aid of an honest-to-goodness expert - Tim Pollard, owner of Heirloom Woodcraft. He liked our original model - and refined it substantially. 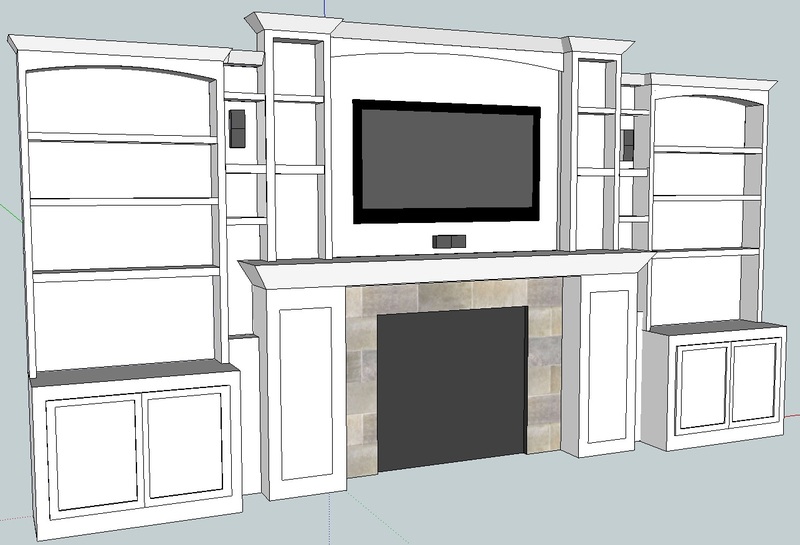 And we got a 3D rendering - Property Brothers style! OK, yeah, that's probably an improvement. No "gap piece" needed! Tim was able to cut down the existing material in order to make everything fit seamlessly. In addition - the design is substantially stronger. The lower cabinets were made taller, so that the mantel was a solid line across the entire room. The hutches had some open shelves, and some closed cabinets. The existing trim-pieces would be removed and updated for a more "craftsman" aesthetic. Tim was going to do most of the carpentry off-site. Before getting started, he had to take some final measurements, and remove some pieces from our existing built-ins. That led to an interesting discovery - the existing mantel that our TV was sitting on was completely hollow - the only thing keeping it in place was the crown molding around the perimeter. Careful, buddy - that's load-bearing crown molding. We had to jam a 2x4 into the mantel cavity in order to keep the TV from falling into the living room. But yesterday, we got started in earnest. Tim spent most of the day installing the lower cabinets, and installing a conduit for wires to run between the TV and the left-side lower cabinet. But even so, we're learning a lot about the design and creation of a built-in home theater. We have had to plan out, diagram and oversee the install of the home theater components, making sure that the right cables can reach the right places. I'll update this post throughout Friday -- and then we'll put Project #1 in the books! It's hard to believe how much this looks like his 3D rendering - it's spot-on. That said, the wires can be accessed and utilized for in-wall speakers, if we decide to go in that direction at some point in the future. 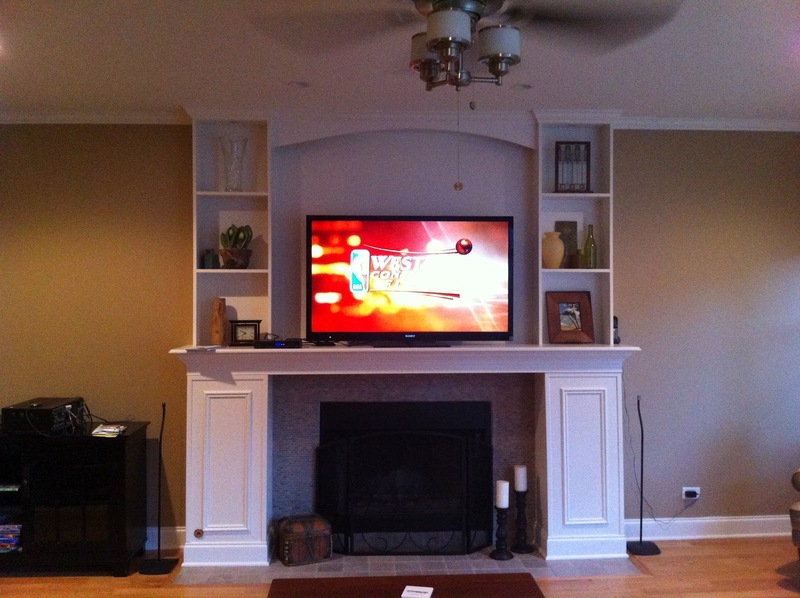 You can also see the 2" PVC pipe that runs from the TV area to the lower-left cabinet. I should have told Tim that our HDMI cables are one-way, as some of them were backward. But switching them around is a snap, and this future-proofs our cable situation. We also have some other big news in the AAAD household - our daughter will be arriving in about a month! Our son is almost eight, so I've officially forgotten everything I once knew about handling babies. I DO know that we're going to need a bunch of new baby-related tech - I see an AAAD post in our immediate future about iOS-enabled baby monitors! Monday Update - We're Completely Done! Compare and contrast with the original 3D rendering! Tim finished everything up on Monday afternoon, and applied a layer of clearcoat paint. Between the HR34 on RF, the AppleTV being controlled via wi-fi, and the TV controlling the Sony components via Bravia Sync, there is no need to open the cabinet doors to operate the system - and no IR blasters! One final note - I'm just incredibly impressed that the HR34 was RF-capable out-of-the-box. This is a 2 year old component, and we're still finding new features and capabilities. If only it did wi-fi without the external bridge, it would be perfect. Well, it would be the HR44, which is awfully close to perfect. So, that's one project COMPLETELY in the books. I'll update the Project #1 Page this week, and we'll turn our focus to the next project!